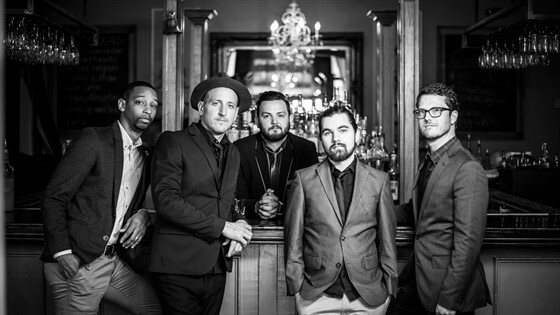 Street Corner Symphony is a contemporary a cappella group based out of Nashville, Tennessee. After competing in NBC’s all-vocal competition, “The Sing-Off,” these southern gents quickly won over sing-off judges Ben Folds (Ben Folds Five), Shawn Stockman (Boyz 11 Men) and Nicole Scherzinger (The Pussycat Dolls), and -most importantly - millions of NBC Primetime viewers after demonstrating their unique, laid-back-yet-dynamic style of a cappella. Since their success on “The Sing-Off,” Street Corner Symphony has made their mark on the music world, recording albums, providing clinics for schools, giving benefits for cancer, performing across the country and around the world, and even working with major artists including Ben Folds, Alison Krauss and Take 6’s Claude McKnight. The five members of the group all hail from Nashville, TN and include brothers Jeremy and Jonathan Lister. Street Corner Symphony moves seamlessly between most styles of music, feeling at home in all of them. Their repertoire covers a wide range, from gospel and barbershop to rock and pop, appealing to the young and old alike.